Where TCR is in ppm/°C, R1 is in ohms at room temperature, R2 is resistance at operating temperature in ohms, T1 is the room temperature in °C and T2 is the operating temperature in °C. Often instead of TCR, α is used. Positive or Negative Temperature Coefficient of Resistance? Resistors are available with a TCR that is negative, positive, or stable over a certain temperature range. Choosing the right resistor could prevent the need for temperature compensation. In some applications it is desired to have a large TCR, for example to measure temperature. Resistors for these applications are called thermistors, and can have a positive (PTC) or negative temperature coefficient (NTC). 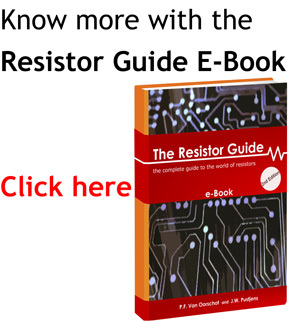 The temperature coefficient of resistance for a resistor is determined by measuring the resistances values over an appropriate temperature range. The TCR is calculated as the average slope of the resistance value over this interval. This is accurate for linear relations, since the TCR is constant at every temperature. However, many materials have a non linear coefficient. For Nichrome for example, a popular alloy for resistors, the relation between temperature and TCR is not linear. Because the TCR is calculated as average slope, it is therefore very important to specify the TCR as well as the temperature interval. The way to measure TCR is standardized in MIL-STD-202 Method 304. With this method, TCR is calculated for the range between -55°C and 25°C and between 25°C and 125°C. Because the highest measured value is defined as TCR, this method often results in over specifying a resistor for less demanding applications. In the chart below the temperature coefficient of resistance is given for a wide variety of materials. Note that the exact value depends on the purity of the material as well as the temperature. Values for TCR depend on purity and temperature.